With this series of 20x20 cm canvases, Mr. Savethewall wants homage some of his most famous subjects. 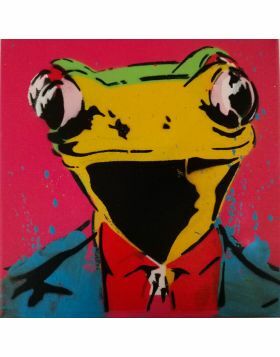 The subject of this canvas is the frog-face of his famous work Kiss Me surrounded by a beautiful red heart. Unique work on canvas, original work signed by the artist. The work is given with the certificate of authenticity.